Playing with water creatures can be fun but also very dangerous at times because most people don’t expect anything to go wrong. A little girl recently had the most horrific experience when a sea lion jumped out of the water to grab her and take her in the water while people around are left terrified with the incident. According to a report in the Daily Mail, visitors at the Steveston Fisherman’s Wharf in Richmond B.C. in Canada were busy enjoying the day with a playful sea lion when things to a turn for the worse. 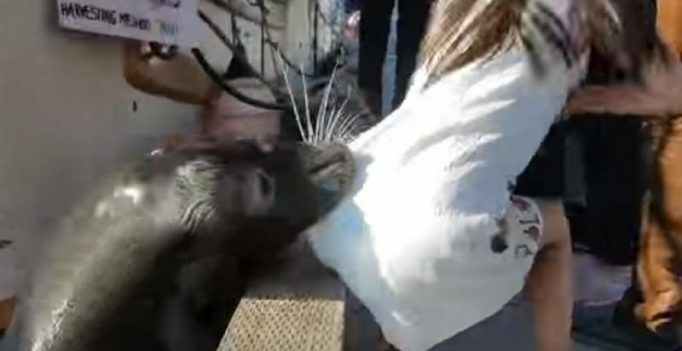 The sea lion suddenly jumped out of the water to grab a girl sitting on the pier by her dress and drag into the water. A family relative however immediately jumped into the water to rescue the girl and brought her out in time. While the lion didn’t reappear the family and other visitors were clearly shaken and soon took the crying girl away from the place. The video was posted on Youtube by a visitor Michael Fujiwara who was casually taking a video of the water creature when the incident took place. It has gathered over 8 million views but the girl was luckily saved in time before anything worse happened.